American Lung Association of Virginia (ALAV) Collection. Historical Collection & Services, Claude Moore Health Sciences Library, University of Virginia. In 1907 Emily Bissell needed to raise money for the tiny Brandywine Sanatorium near Wilmington, Delaware, so it could operate through the winter. Her cousin, Dr. Joseph Wales, a physician at Brandywine, had asked for her help to keep it open. She was very active in the American Red Cross and had considerable experience in fund-raising. She decided to sell “Christmas Seals” to raise the $300 ($6,600 in 2008 value). They were small, colorful stamps to put onto mail in addition to postage stamps. Idea for Christmas Seals. 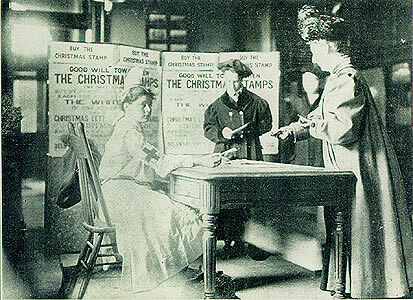 Bissell got the idea for a sale of Christmas Seals from an article written by Jacob Riis, the Danish-American journalist and social worker. Riis, who lost seven brothers to tuberculosis, wrote the article suggesting that the United States adopt the Christmas Seal program begun by a postal clerk in Denmark to raise money to fight tuberculosis. In its first year, the Danish campaign raised enough money to build an entire TB hospital. Bissell begins U.S. Christmas Seals. Bissell borrowed money from friends to print the first 50,000 seals and got permission from the Wilmington postmaster to sell them in the post office lobby — for 1¢ each, the equivalent of about 25¢ today. On her first day, Bissell raised $25, but then sales slowed. She asked for help from The North American, one of Philadelphia’s most popular newspapers. Every day the newspaper ran articles under the heading, “Stamp Out Tuberculosis.” Her Seals sold so quickly that she had to order another 250,000. U.S. President Theodore Roosevelt learned about the campaign and enthusiastically endorsed it. By the end of the Christmas season, Emily Bissell had raised $3,000 ($66,000 in 2008 value). Going national. Emily Bissell’s Christmas Seal Campaign went national the next year, sponsored by the American Red Cross. In the next two years, they raised almost $300,000. 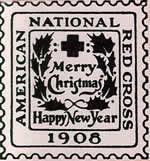 The American Red Cross sponsored the Christmas Seal until 1919, when the National Tuberculosis Association (later renamed the American Lung Association) assumed exclusive control of the project. 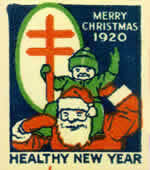 The emblem of the NTA, the double-barred cross, appeared for the first time on a Christmas Seal in 1920 and is still used today. 1920 Christmas Seal ALAV Collection. 1908 Christmas Seal ALAV Collection. This section is adapted from “The Story of Christmas Seals,” part of a 1998 exhibit by Donny Wright and Joby Topper in the Claude Moore Health Sciences Library on the American Lung Association. The Web version of this exhibit (link below) contains more information about the American Lung Association, its battle against tuberculosis, sanatoriums in Virginia, and Christmas Seals.